A fumble recovery on Washburns seven yard line set up the winning score as Nebraska had a tougher time than expected in its season opener against Washburn. 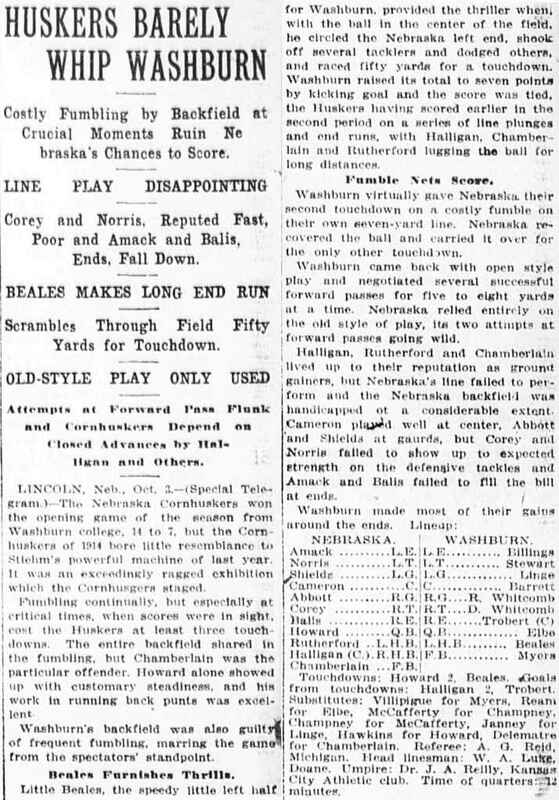 Despite the victory, it was a wretched exhibition by Nebraska, said the Lincoln Star, citing 10 Cornhusker fumbles. The Omaha World-Herald concurred, calling Nebraska's performance a "pitiful exhibition of football." The game was a mixed bag for future Hall-of-Fame end Guy Chamberlin, playing fullback in his debut as a Cornhusker. He was credited by the Omaha Bee with lugging the ball for long distances but was singled out as the particular offender in terms of fumbling. 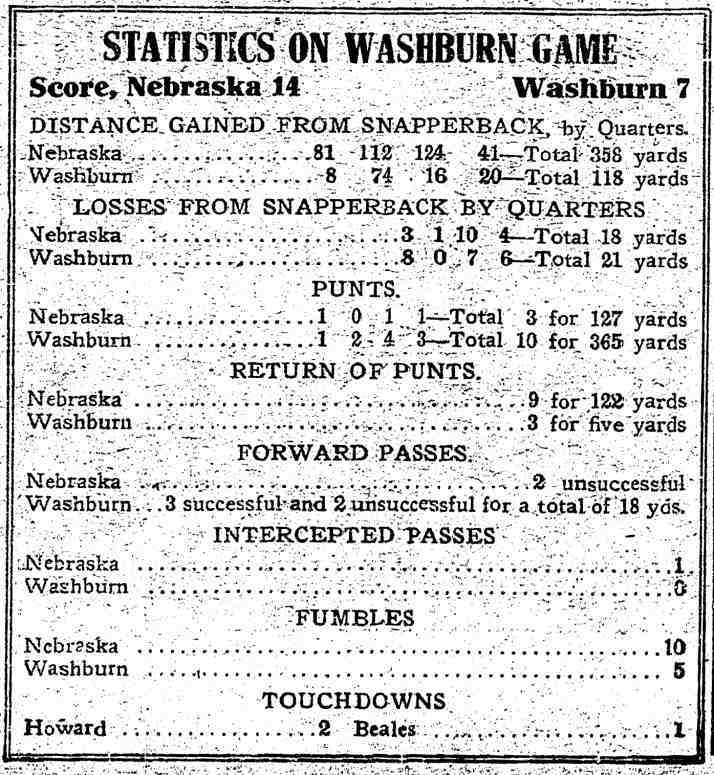 HUSKERS BARELY WHIP WASHBURN Costly Fumbling by Backfield at Crucial Moments Ruin Ne braska's Chances to Score. LINE FLAY DISAPPOINTING Corey and Norris. Reputed Fast, Poor and Amack and Balis, Ends, Fall Down. BEALES MAKES LONG END RUN Scrambles Through Field Fifty Yards for Touchdown. OLD-STYLE PLAY ONLY USED Attempt nt Komard l'an Flunk and I iinihiKki n Depend I loni'il dvnnces by Hsl Hann nnd Other. LINCOLN", Neb., Oct. S.-(Ppeclal Tele (tisni V Tho N'ebrnska t'ornhtiskers won the npenlng game of the season from Washburn college, 14 to 7, but the Corn buskers of 1!M4 Iwiro little resemblance to Stlelim's powerful machine of last year. It was an exceedingly ragged exhibition which the ( 'ornhusgers staged. Fumbling continually, but especially at critical times, when score were In sight, cent the Hunkers at least three, touch downs. Tho entire backfield shared In tho fumbling, but Chamberlain was the particular offender. Howard alone showed up with customary steadiness., and hla work In running back punts was excel lent Washburn's backfield was also guilt rl of frequent fumbling, marring the limiiV from the spectators' standpoint. Ilealea Furnishes Thrills. Llttlo Reales, the speedy little left half for Washburn, provided the thriller when, with the ball In tho center of the field. he circled the Nebraska left end, shook, off several tncklers and dodged others, and raced fifty yards for a touchdown. Washburn raised Its total to seven points by kicking goal and the score was tied, the Hunkers having scored earlier In the second period on a series of line plunges and end runs, with Halllgan, Chamber lain ami Rutherford lugging the bail (or long distances. Washburn came back with open style play and negotiated several successful forward nasses for five to elirht virHi .i.. ...i ... ...... .... . . eiyie in piay, ii tag ailiupis at w r'l passes going wild. ti.iu i. naiiiitii, ii Rutherford and Chamberlain up to their reputation as groumt gainers, but Nebraska's line failed to per forin and the Nebraska backfield was handicapped nt a considerable extent. Cameron pliud well at center, Abbott and HhlelUj nt gaurria, but Corey ami Korrls fslled to show up to expected strength on the defensive tackles and Amack and Halls failed to fill the bill at ends. . Washburn made most of their gains around the ends. Lineup: NFHRASKA. I WASHBFR.V. Amack .. Norris ... hleldB .. Cameron Ahbolt .. Corey ... ...URIbK . .L.T.II..T ...L.G. l.tl C.C ...II O.IR.U....R. ...It. T.I K.T....O. ... Billings .. Stewart Llnge . .. Burrett Whiten nib Whlloomh Balls R. K. It K Trobert fCl Howard Q H ly.i: Kibe Rutherford .. L. II. B. L. I1.B Denies Halllgan (C I.R.Il B.F B Myeis Chiinberlain ...F.B. Touchdowns: Howard I. Beales. aGoals from touchdowns: Hiilllgan 2, Trobert. Substitutes: Vllllpigue for Myers, Ream for Kibe, McCafferty for Champney, Chumpney for McCafferty, Janney for I.Inge, Hawkins for Howard, Delemntra for Chamberlain. Referee: A. O. Reld, Michigan. Head linesman: W. A. Luke. Ooane. Umpire: Ir. J. A. Retlly, Kanau Clly Athletic club. Time of iUarters:,li minutes.